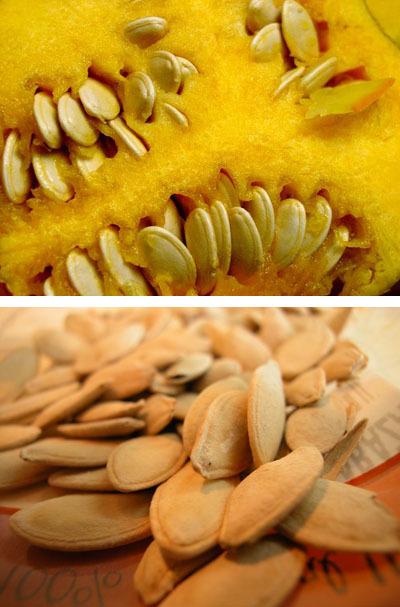 Saving seed from pumpkins can be a bit more complicated than tomatoes. It can also be even more simple – it all depends. What it depends on is understanding the pollination mechanism. Tomatoes are self-pollinators, which means that each flower pollinates itself and insects and wind don't play a significant part. This means when we save seed we can expect that our tomato plant is both father and mother to the seed and any offspring will be true to type. Pumpkins on the other hand are cross-pollinators. They have separate male and female flowers. Pumpkins rely on insects (or humans) to carry pollen between the male and female flowers. Without this intervention fruit won't form and we won't get seeds. The trouble is that insects can't tell the difference between a Queensland Blue and a Kent pumpkin and the pumpkins don't care. Their offspring will combine traits from both parents and they might not be the best traits either. To keep a variety pure we need to ensure that both parents are the same type of pumpkin. The easy way to do this is to grow your pumpkins more than 400 metres away from any other type of pumpkin. For those with more advanced seed saving skills varieties can be kept pure by taping the flowers and hand pollinating. If you live on a rural property you are probably lucky enough to be able to just scrape the seeds out when you cut your pumpkin for eating. A little washing and drying and you have seed to sow next year. Of course, if you were growing an F1 hybrid pumpkin this won't work. If you live in town then it is more than likely you are within 400 metres of another pumpkin grower and you will either have to hand pollinate or get next years seed from the Bega Valley Seed Savers (BVSS) display at Candelo Bulk Wholefoods. The same cross-pollination issues occurs with cucumbers, squash and zucchini so the BVSS are always looking for people who are prepared to grow a variety through to seed.